Do not keep your magnificent collection models in boxes and cabinets, the worst damage that models can suffer is accumulion of dust and bumps. Exposing them in these beautiful methacrylate design showcases avoids both dangers, in addition enjoy them by putting them clearly visible without any risk. 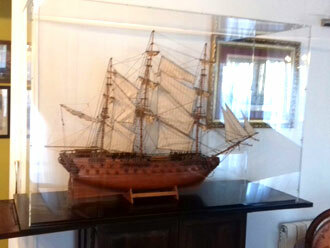 Here you can find the best and most practical methacrylate showcases for your collection of naval models, although you can also use them for any type of collections (cars, trains, scalextric, lead figures, perfums, minerals, dolls, models, etc.). 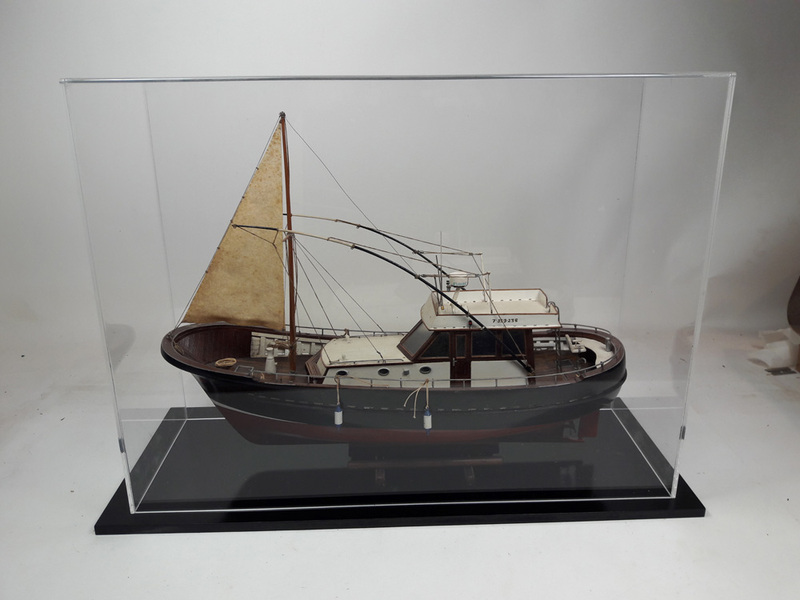 Our showcases are manufactured with a black lacquered wooden base to enhance the quality of the exposed model, although if you wish, we can also make them without base or methacrylate base. All showcases are manufactured on request and according to customized measures for each client. In case the size of them is greater than 50cms length, the showcases are manufactured in a removable way, where they can be sent more easily and safely. The assembly is very simple with small screws in the joints that are not much visible. No need for glues, as the pieces fit like a puzzle and are joined by the screws. This makes them very practical if you want to move the showcases in exhibitions or fairs. 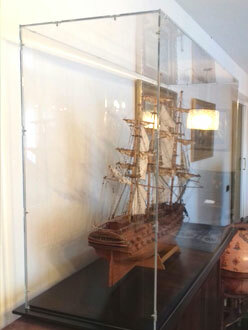 These showcases are not sold in stores and it is guaranteed that the shipments arrive in perfect condition. In case of any damage, the damaged parts are immediately replaced at no cost for the customer. If you are interested in knowing the price of your showcase, please contact us with our contact form, or by writing an email to info@nauticadecor.com, indicating the measurements of the model you wish to protect, and we will calculate the showcase size.